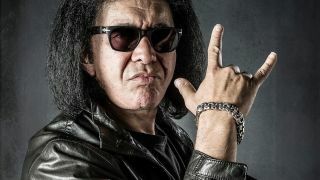 Kiss star Gene Simmons has filed an application at the US Patent and Trademark Office to register the iconic devil’s horns hand gesture which is used by rock and metal fans the world over. The Hollywood Reporter say that the bassist and vocalist claims he first used the hand gesture in November, 1974, during the band’s Hotter Than Hell tour. However, it would appear that the hand signal dates back to the 5th century BC and the founder of Buddhism, while John Lennon is seen using the gesture in photographs taken at the time of the release of the Yellow Submarine movie in 1968. The cover of Coven’s 1969 album Witchcraft Destroys Minds & Reaps Souls also featured members of the band making a similar hand gesture – although the thumb is positioned differently to Simmons’ application. The trademark application has been accepted by US Patent and Trademark Office but has not yet been assigned to an examiner. Kiss have a handful of live dates remaining on their current world tour. Find a list of their remaining shows below.